15 EUR for 7 days data-plan with a 12 GB traffic limit. 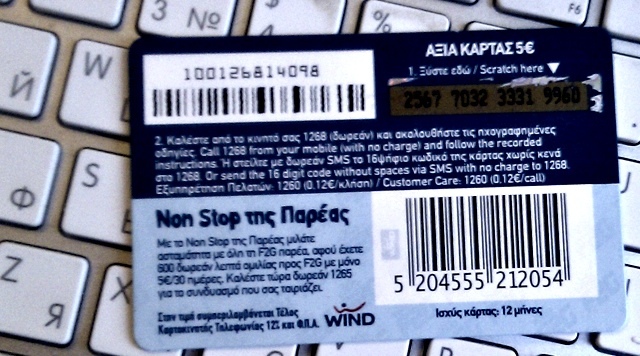 Because several laws recently changed in Greece, you now must visit the WIND's office or point of sale with your passport in order to buy a sim cad. Office staff speaks english well, so you should not have any significat troubles, but I suggest to find the nearest WIND office before you travel as when you will arrive your vacation place (usually it is far from big cities) there may not be any WIND office nearby. Do not forget your passport before visiting WIND office ! 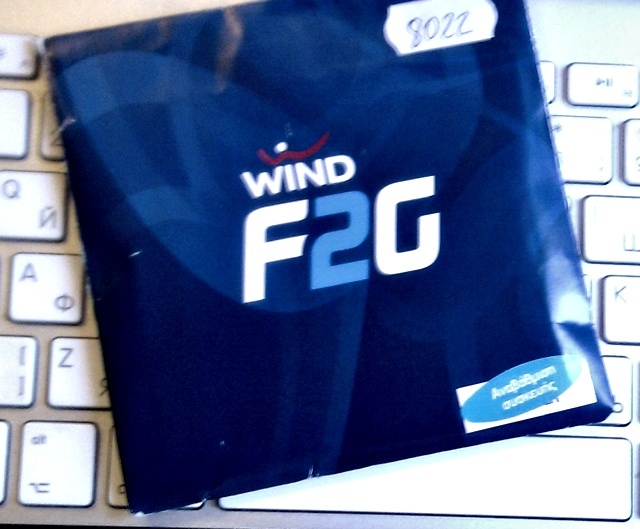 Visit nearest WIND office or WIND reseller and buy a WIND F2G sim card package. Ask cashier to activate your sim card (will send an sms). Note, that sim card activation does not activate cheap data-plan - Internet will work but per MB cost will be about EUR10 which is too high. Ensure to top-up your account balance up to at least EUR17. Activate a cheap dataplan - send sms message with the text "NS7" to number 19595 - after receiving a confirmation message, you're on a cheaper data-plan now. Important - this is not an unlimited dataplan. This is a 7 days package with a max traffic of 12 GB. If you run out of 12 GB or out of 7 days period, your phone will silently switch back to expensive 10EUR/MB mode. Be careful - you may or may not receive a message by the end of 7th days about expiration. There is also no fixed 23:59:59 deadline - WIND's billing may switch you several minutes before or after. So I strongly recommend you to stop using internet at least before 23:00:00 of the last 7th day. Another important message in case you want to extend and buy another 7 days - DO NOT DO this inadvance, until your previous 7 days package is expired - WIND's billing is very glitchy, it may ignore your next NS7 request (but withdraw the money !) and then you'll be still sitting on an expensive internet - all absolutely silently. So wait at least next midday before sending another NS7 message. 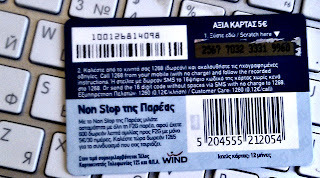 Your WIND sim card will be valid for 12 month from last account top-up, in case you'll want to keep it for next Greece visits. press "2" when you'll hear a greeting in Greek language.